This place was recommended by a friend’s sister a couple of years ago. 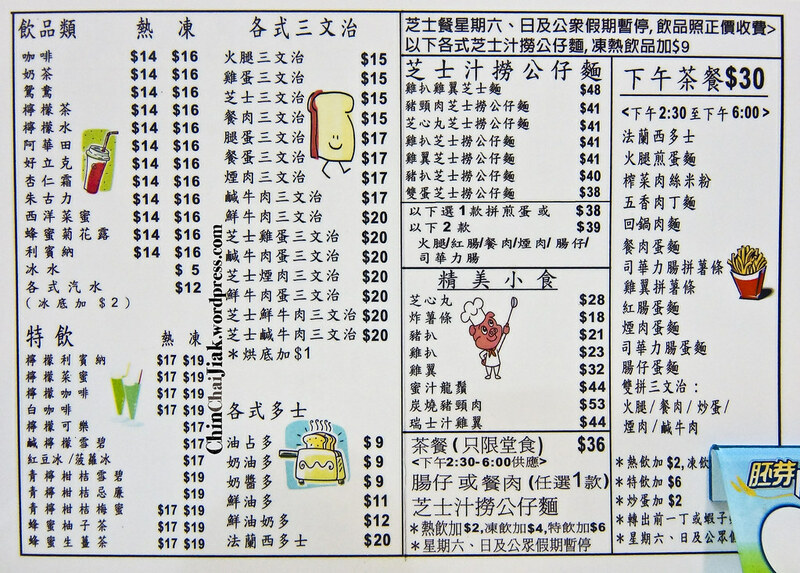 Comparing to most of the eateries that i blogged about in my Hong Kong food itinerary, this is a less known to Singaporeans and almost all of my friends have not heard of it. 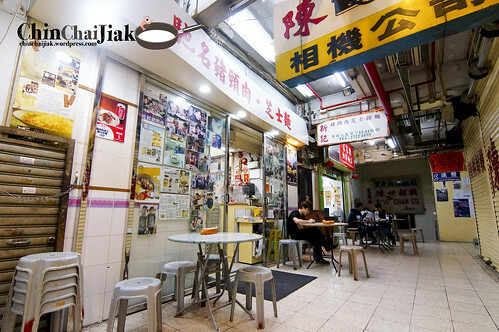 Upon entering the eatery at Tsim Sha Tsui, the first thing that caught your eyes is definitely the Hong Kong Stars studded photos displayed on their wall. It includes Grasshopper (草蜢), Edison Chen and a few Hong Kong Stars that i can recognize but not name. 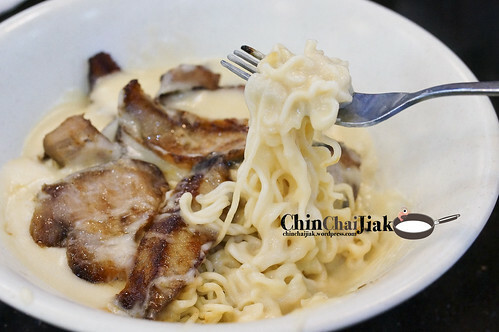 Sun Kee’s signature dish is their grilled pork cheek (or pork jowl) in cheese sauce, or I simply call it the cheese noodle. 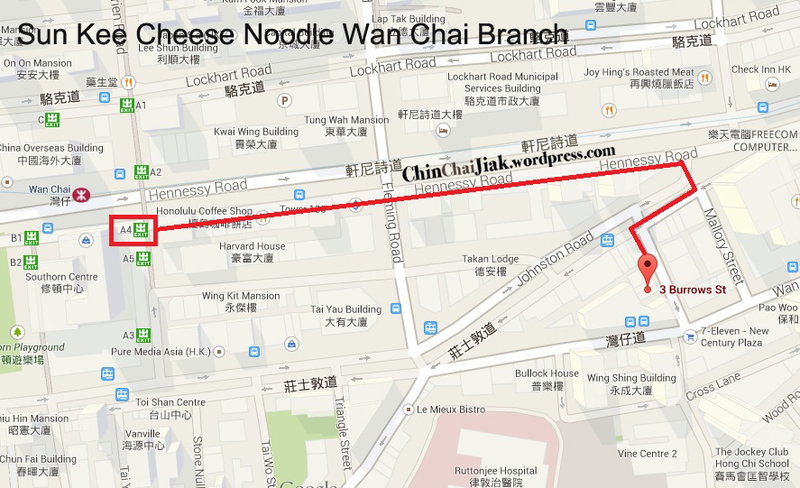 I visited their two outlets, one at Tsim Sha Tsui and a newer branch is at Wan Chai. 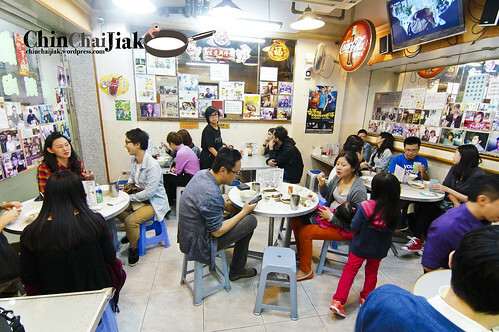 And the reason for visiting this place whenever i visit Hong Kong? 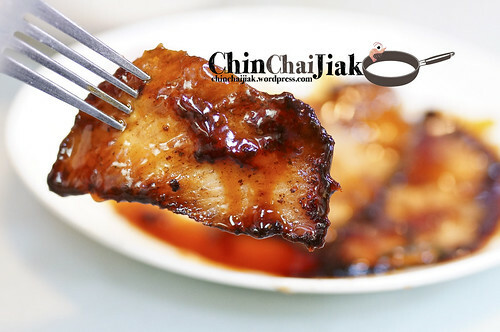 Matchless Grilled Pork Cheek, be it from Singapore, Bangkok or Hong Kong itself. Pork Cheek refers to the cut at the jaw area, at the hollow of a pig’s cheek. This area is mainly made up of lean meat, interlaced with thin layer of fats. As pork cheek is not exactly tender, the best way cook is to cook is for an extended period of time until the fiber and fats break down. 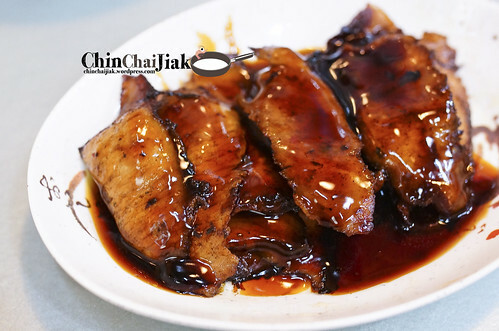 It’s also one of the best cuts for barbecued pork. I’d tried pork cheek in various eateries in Singapore, Bangkok and Hong Kong but my favourite is still Sun Kee’s. Theirs are very well marinated and has an exceptional grilled fragrance. If pork cheeks are grilled properly, the interlaced fat breaks down and melts in your mouth and that is exactly what Sun Kee has to offer. Their cheese noodle is also the reasons for my visit. At first glance, it appears to be really cloying but apparently not. The cheese sauce is not exactly heavy on the stomach. The taste is very balanced and the cheese is not overpowering. 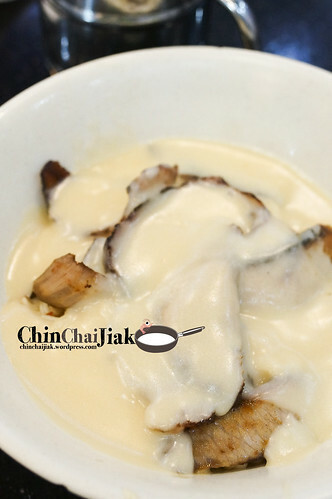 It is especially enjoyable when the cheese mixes with the oil from the grilled pork cheek. The only thing is they are not too generous with their cheese sauce for the price paid (HK$42 or S$7). As pork cheek doesn’t come cheap because of their limited availability on a pig, i guess this price is still kind of reasonable. 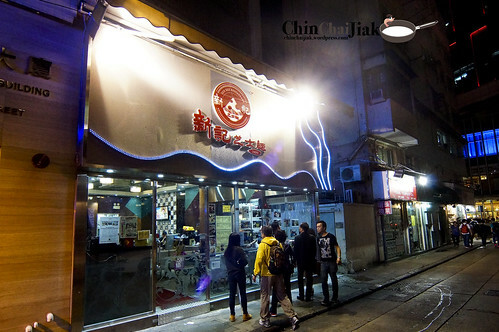 I visited their Wan Chai branch on my last visit and I’m glad that the taste doesn’t differs much from Tsim Sha Tsui’s. The menu is slightly different so i ordered their dry noodle with pork cheek. In actual fact, it taste exactly like indo mee (a kind of instant noodle that can be found in Singapore) andddddddd I LOVE IT! It’s quite dumb to pay such a price (HK$43) for an instant noodle actually but i still get to eat the grilled pork cheek with my favorite instant noodle so who cares. 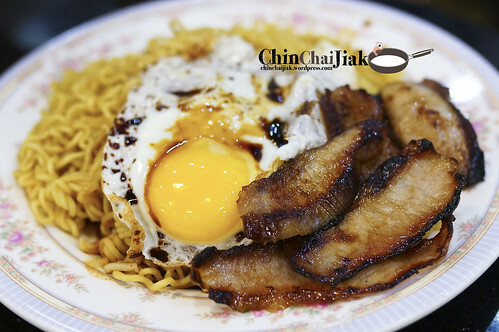 Only order this if you really really like indo mee. 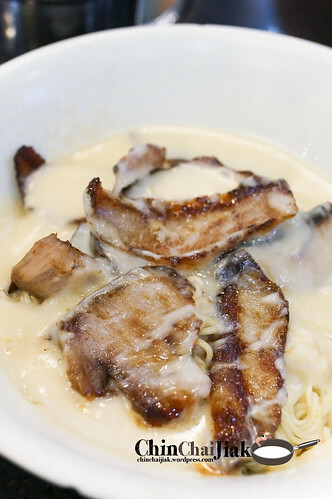 You can order just the grilled pork cheek if you can’t get enough of it, but i thought it taste better when it’s paired with cheese sauce. 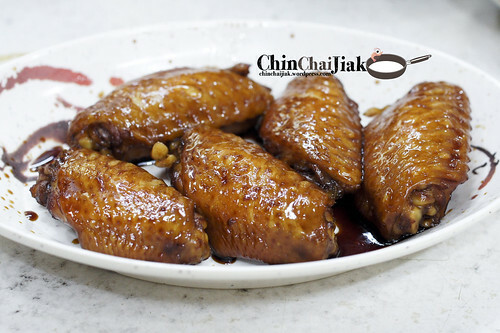 For my past visits, I tried other dishes like the fried rice, sausage and egg cheese noodle and their chicken wings but they are not exactly worth It. The cheese ball is not bad, and you may order their grilled pork cheek itself but i still think it’s taste best with cheese sauce. Cheese Ball, drizzled with cheese and the filling is cheese. The chicken wings. Nothing special and i thought there is an artificial taste in it’s marinate. Actually I am a little reluctant to write on this eatery because the lesser the people know about this place, the better. Most of the time, there is no queue when I visited and this place so it’s not bad to keep its this way. But I thought my blog is not that influential anyway so I thought I shall just share it for the benefit of my readers. Out of my five visits, there was one time (the third time) which the Grilled Pork Neck didn’t keep up with the standard while the rest of the fours times were great. 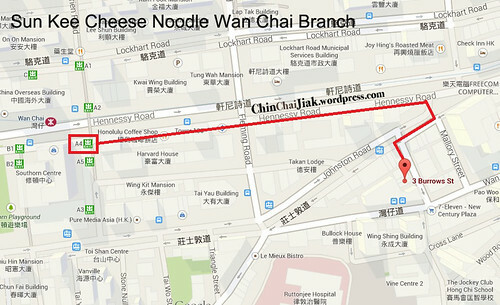 I think i actually recommend their Wan Chai branch more because it’s more comfortable and easy to find. In fact, it’s only thirty seconds walk from Capital Cafe. You may read up more on Capital Cafe and their black truffle scrambled egg toast here. So far, after so many trips to Hong Kong, this is still one of my must-visit. Even if i am really really full, i will just probably share a bowl of noodle among two person. This is so-call die die also must eat. I’d recommended Sun Kee to a couple of friends and some say they love it. Another one say it’s nice, but don’t need to visit every time. Let me know how do you find it. 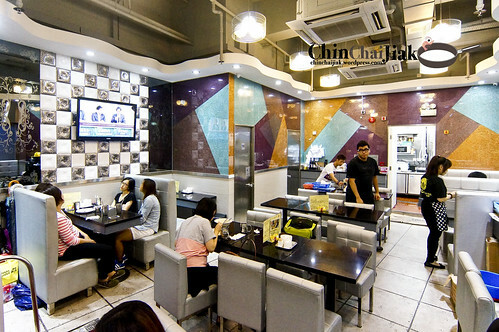 The interior of Wan Chai Branch. Actually it’s much more comfortable than Tsim Sha Tsui Branch. 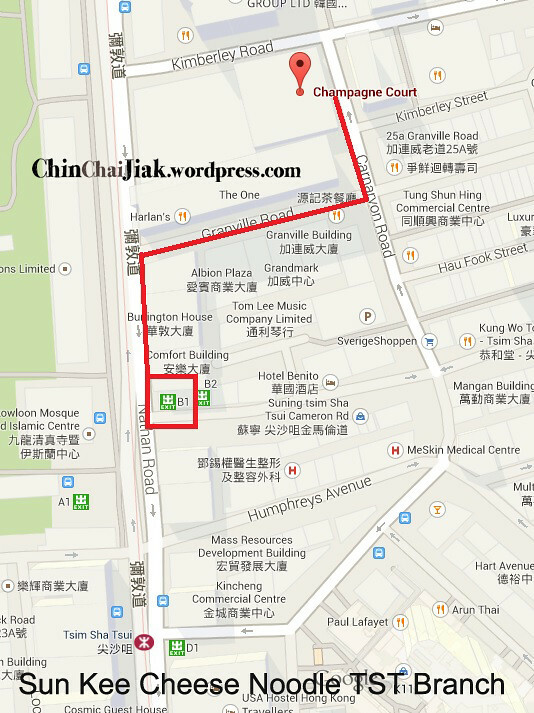 It’s easy to locate Champagne Court by coming out from Exit B1 of Tsim Sha Tsui station, walk along Nathan Road and turn right into Granville Road then turn left on Carnarvon Road. When you reach Champagne Court, you may a little effort to locate the eatery as it is within the building at ground floor. 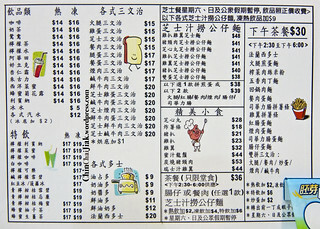 This entry was posted in Dishes - Cheese Ball, Dishes - Cheese Noodle, Dishes - Grill Pork Cheek, Location - Tsim Sha Tsui, Location - Wan Chai, Type - Hong Kong Style Cafe and tagged Champagne Court, Cheese Ball, Cheese Noodle, Granville Road, Grilled Pork Neck, Hong Kong, hong kong food, Sun Kee, Sun Kee Cheese Noodle, Tsim Sha Tsui, Wan Chai. Bookmark the permalink. Do they have english menu here? I’m lost…. how big was the serving and dont i need to order other food for me to be full? 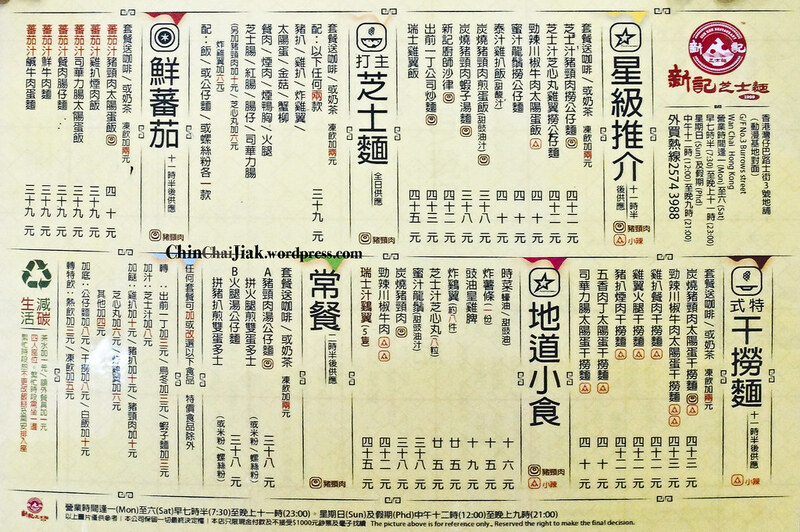 So can you please write the cheese noodle and pork cheek in Chinese so I can order it. 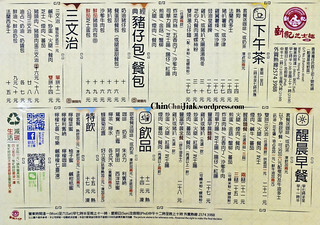 I have no idea what to order by looking at the menu since I don’t speak Mandarin or Cantonese. 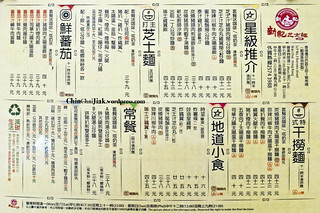 I will be in Hong Kong next week and will use your guide. Thanks, I got to try this and it is great. 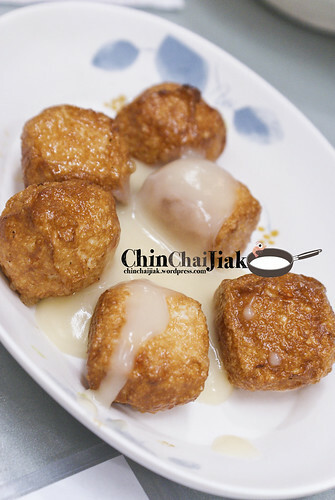 Just tried this at the tsim sha tsui branch and not that many ppl when i was there, even though it was during lunch hour. Had the cheese pork cheek noodle, french toast and hot tea and it was great! Thanks a lot for the recommendation! 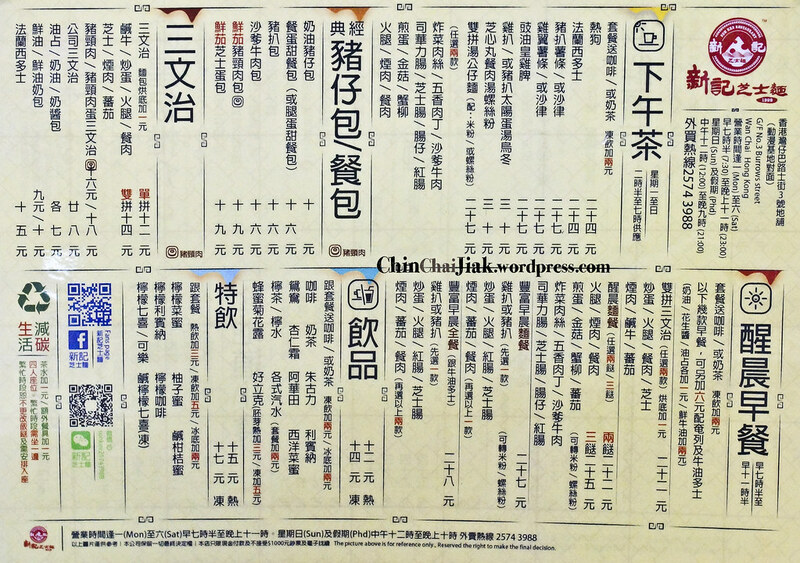 There is an english menu on the cheese noodles and drinks portion only.